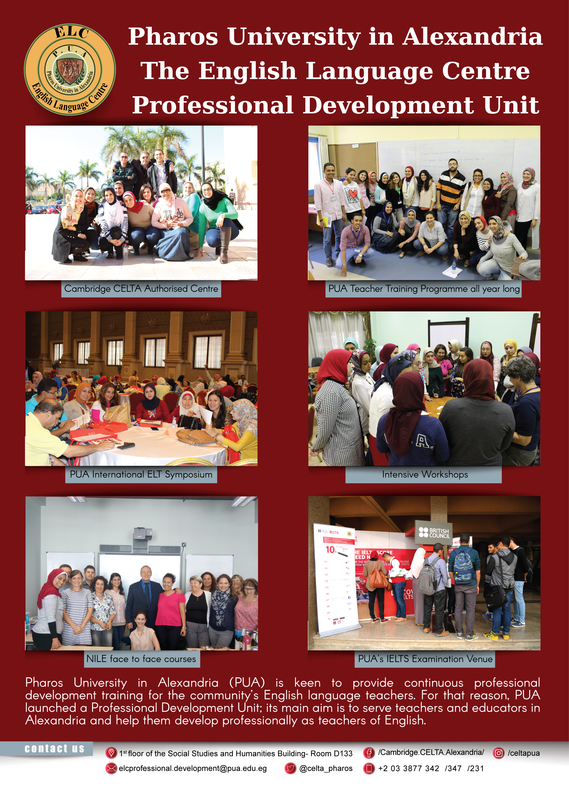 Pharos University in Alexandria, in its endeavor to raise the standard of English of its undergraduate students, launched the English Language Centre (ELC) in the summer of 2010. Serving eleven faculties, the ELC at Pharos University provides English language instruction to non-native speakers of English to prepare them for university study. The ELC provides English courses for many purposes: academic, business, tourism, law, and general to enable students meet the challenges of real life. The ELC mission is to provide English language instruction of the highest quality, in which university students can enhance their English skills. Our professional staff and master holder instructors focus on each student’s personal, academic and professional goals; hence they deliver high quality service, and instruction. The ELC strives to create a learning environment that is intellectually stimulating and interesting. Teacher Training Workshops: One day and/or intensive training workshops that serve teachers and educators in Alexandria and help them develop professionally. All workshops are delivered face to face in at PUA. Find out more about Pharos University Professional Development Unit (PDU). General English Courses: These courses serve the community with discounted prices. They are offered all year long. Interested applicants will need to take a placement test first. Also learn more about Pharos University language scholarships. IELTS: Pharos University English Language Centre provides IELTS preparation courses to prepare candidates for the exam.